Extra Virgin Olive Oil (EVOO) tasting presented by Francois Ferreira, brand ambassador for De Rustica Olive Estate. Francois explained the difference between “good oil” and “bad oil” as well as the many health benefits that come with using EVOO every day! All were given a taste of De Rustica Extra Virgin Olive Oil – very interesting! There is a wide range of flavours found in extra virgin olive oils. Flavours are determined by several factors including type of olives, ripeness of olives, growing conditions, and oil storage. Try an olive picked off a tree! Olives are bitter – and so is good olive oil. Bitterness, pungency and fruitiness are all present and well-balanced in the very best olive oils. The nose is gently fruit with greener olive notes perceive, the mouth feel is very good with soft almond nuances on the palate. The nuttiness is followed by a gently hint of pepper. A lively, green olive fruity aroma, followed by good fruit on the palate, hints of bitter almonds, very nice mouth feel, and ending off with a very pleasant pepper top note, the aftertaste of which lingers on and on. An intense aroma, which reminds one of green olive fruit together with a hint of dry grass, lots of fruit on the palate, rich mouth feel and the oil is balanced by the finishing piquancy (pepper). 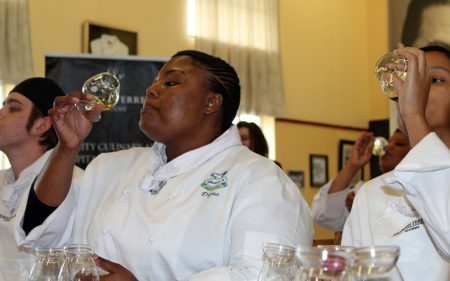 Understand the secret of SA Olive Awards gold award winning extra virgin olive oil. When you drive through our beautiful area next time, stop and join us for an unforgettable extra virgin olive oil tasting experience! You’ll never think of extra virgin the same way again. Freshness and quality all in one bottle of De Rustica Extra Virgin Olive Oil.